I am about 9 months away from the big 3-0, and have started to notice that my skin is starting to age. It’s especially noticeable to me around my eyes and between my eyebrows where there are frown lines. My mother never taught me the importance of caring for my skin beyond applying sunscreen so that I wouldn’t burn, so everything that I know now about skin care I have learned on my own from magazines, friends, or from testing out products on myself. It’s been a pleasure using products by Sibu Beauty to care for my face in all sorts of ways. I was sent 5 products to test out, and I have loved each and every one of them. But before I tell you about the products, I want to tell you about the company itself. Sibu was founded in 2003 when the founder traveled to Calcutta and met a specialist in herbs and plants. 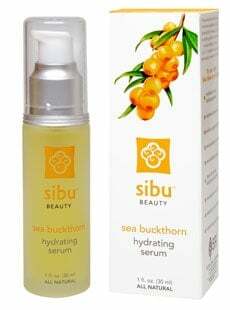 Bruce McMullin learned about a fruit called the Sea Buckthorn Berry, which is used in all of Sibu’s products. You can read more about the qualities of Sea Buckthorn. 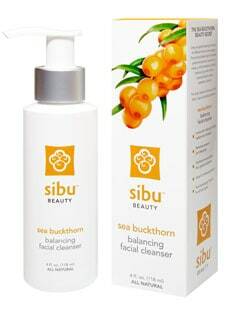 The first product I tried from Sibu was the Sea Buckthorn Cleanse & Detox Face and Body Bar. This 2-in-1 body bar is perfect for traveling! Since I carry on my luggage, I try to pack as few liquid things as possible, and this allows me to cleanse both my face and my body. My skin never feels dried out from using it, and it even seems to have exfoliating properties to it. The other products I have been using are the Balancing Facial Cleanser, Hydrating Serum, Daytime Facial Cream, and Replenishing Night Cream. This 4 fl. oz. bottle of face wash should be used once in the morning, and then once at night on both your face and your neck. Its greatest benefit is locking in your face’s natural moisture. It is also terrific at removing dirt from your skin, and I was impressed at its ability to help me rinse off my makeup quickly and easily. It also gently exfoliates, and is for all skin types. Its retail price is $17.95. This 1 fl. oz. bottle of serum helps with the tone and texture of your skin and fights ageing without the chemicals that other products contain. It also stimulates collagen, and protects your skin against environmental stress. It’s not oily at all, though when first applied it will feel sticky. Give it a few minutes, and then your face will feel soft and moisturized with no sticky residue at all. This product retails for $39.95. This 1 fl. oz. bottle of facial cream will help heal damaged skin, especially any sun damaged skin. It contains nutrients that are good for your skin and smells slightly like a citrus. It’s not overpowering, and will help you feel fresh and awake after use. It retail price is $20.95. This 1 fl. oz. jar of night cream reduces any visible sun damage, stimulates the renewal of cells, and will reduce the appearance of wrinkles and fine lines. Use after washing your face at night with the balancing facial cleanser. This product retails for $34.95. Depending on what your skin care needs are, you can buy in packages and save some money. Visit the products page now to see the potential savings on these products and to learn more about them. When you do try them, I’d love to know what a difference they have made for you and your loved ones! Connect with Sibu on Facebook and Twitter. The products sound good,and the prices are reasonable too.I’d like to start using products like this *before* I start seeing the skin damage and age related problems.